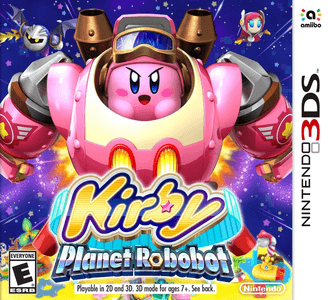 Kirby: Planet Robobot (星のカービィ ロボボプラネット Hoshi no Kābi: Robobo Puranetto, "Kirby of the Stars: Robobo Planet") is an action platformer video game developed by HAL Laboratory and published by Nintendo for the Nintendo 3DS. It is the fifteenth main installment in Nintendo's Kirby franchise. Kirby: Planet Robobot works near flawlessly in Citra. Graphically, the game is considered near perfect and performs well on decent hardware. It still suffers from minor audio issues (e.g. some sound effects sounds a bit strange), but this does not hinder the gameplay in any way. Overload Ocean - Door 2 Only File 1 at 12% of completion, starts in Area 3 "Overload Ocean" at Door 2.